The best protein for building muscles! WHEY 100 contains 100% highest quality whey protein, which is an ideal source of full-value animal proteins. WHEY 100 is rich in all amino acids your body needs to build muscle fibres, including BCAA and L-Glutamine. WHEY 100 dissolves extremely well and is quickly assimilated. Whey proteins it contains are potent triggers of anabolic processes leading to muscle development. WHEY 100 contains 100% whey protein concentrate with the concentration of pure protein exceeding 80%. WHEY 100 is manufactured through a process of ultrafiltration, giving it exceptionally low fat and lactose content. Only the highest quality whey protein concentrate is used in the production of WHEY 100 – a highly purified and fast-acting source of wholesome proteins. WHEY 100 contains just whey protein with no unnecessary additives lowering the protein content in the final product. Whey protein concentrate is one of the most popular and most effective natural proteins. WHEY 100 perfectly supplements shortages of protein that arise at times when it is most required, in particular in extreme sports, bodybuilding or during weight-loss diets. The highest class raw material in an instant formula used in the production of WHEY 100 is characterised by a high biological value (BV104) and excellent purity and solubility. WHEY 100 contains concentrated whey protein, easily absorbed by the body. Due to the exceptionally high rate of digestion and absorption, the most important anabolic amino acids reach muscles instantly. The exceptionally high content of rapidly released L-leucine acts as a starter for anabolic processes. An intensive influx of building materials stimulates the synthesis of muscle proteins, increasing its intensity by as much as 70%. Other branched-chain amino acids (BCAA) and L-glutamine inhibit adverse catabolic reactions. The prevalence of anabolic processes helps build high quality muscle mass. WHEY 100 is not only the best supplement – it’s also an unforgettable experience for your palate. 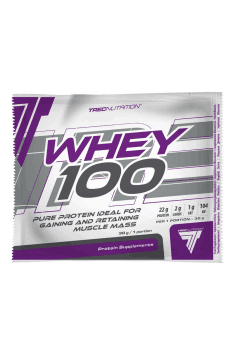 WHEY 100 includes sophisticated, original and carefully refined flavours which you’ll remember for a long time. The unique quality and composition of WHEY 100 significantly exceed the properties of other similar products available on the market. WHEY 100 is a universal product for everyone, perfect as a daily protein supplement which quickly provides high levels of anabolic amino acids essential for muscle growth. WHEY 100 contains a wealth of the most important components with anabolic properties whose levels are critical for the rate of muscle growth and regeneration following exercise. Use WHEY 100 up to 1.5h following exercise and your muscles will receive an injection of essential building materials and a powerful impulse for growth. The product is also excellent for increasing the nutritional value of meals and supplementing them with additional, easily absorbable protein. People with a slower metabolism are recommended to use the formula before sleep and between meals, helping to significantly accelerate metabolism. Cocoa powder for the taste of chocolate, chocolate-cherry, chocolate-sesame, chocolate-coconut, chocolate-nut cream, chocolate-orange and gingerbread; acidity regulators for strawberry and raspberry flavor - citric acid, malic acid; fragrances; thickener - sodium carboxymethylcellulose; sweetener - sucralose; dye for vanilla, banana, cookie, pinacolada, advocat and peanut butter - beta-carotene; dye for strawberry and raspberry flavor - cochineal red A, color for the taste of peanut butter - ammonia caramel.